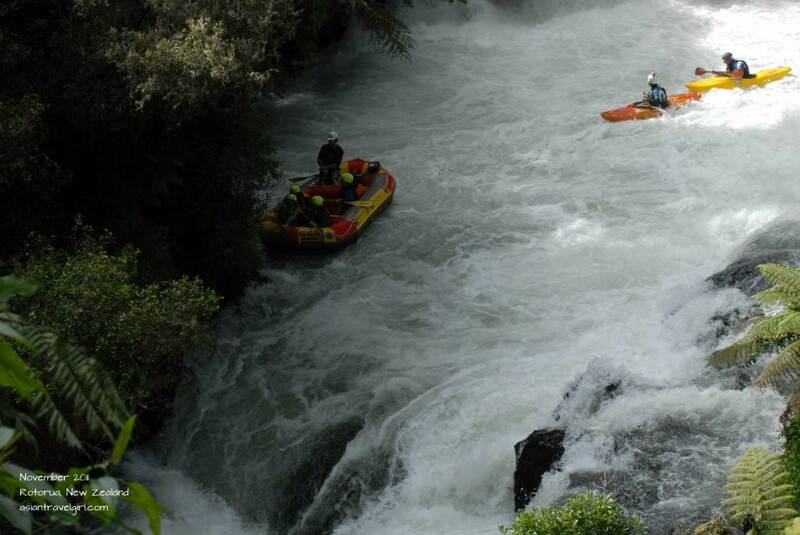 White water rafting is one of the must-do experiences when you visit Rotorua– a town 3 hours drive away from Auckland. This town is action central, packed with adrenaline-rushed activities. 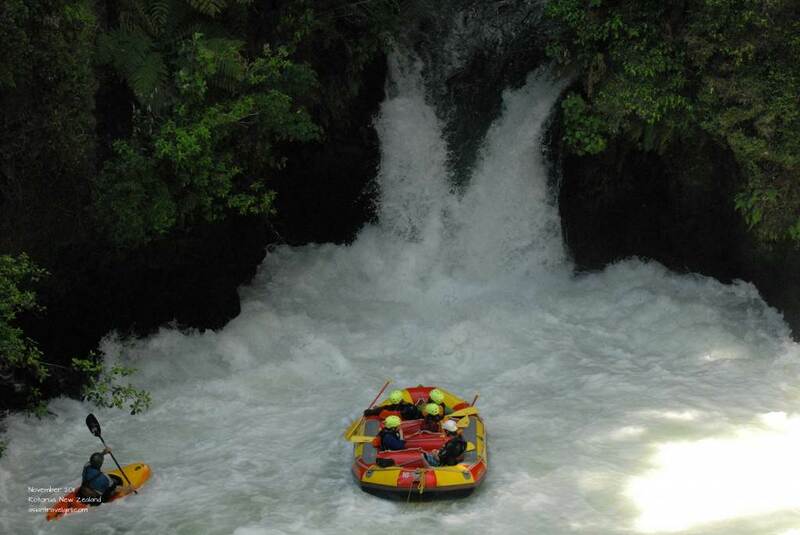 We choose Oreke Falls as our white water rafting location since it was only 15 minute drive from central Rotorua. As usual we booked our trip from Bookme, which gave us 50% discount off the original price (originally NZD$82) if we do the 9am session. Guess no one wants to get up that early since it is the coldest time of the day to do water activities. Nevertheless we all toughed up and got ready for this adventure! Demonstrating what the waterfall looks like. We first arrived at a shed to change into the standard safety outfits. 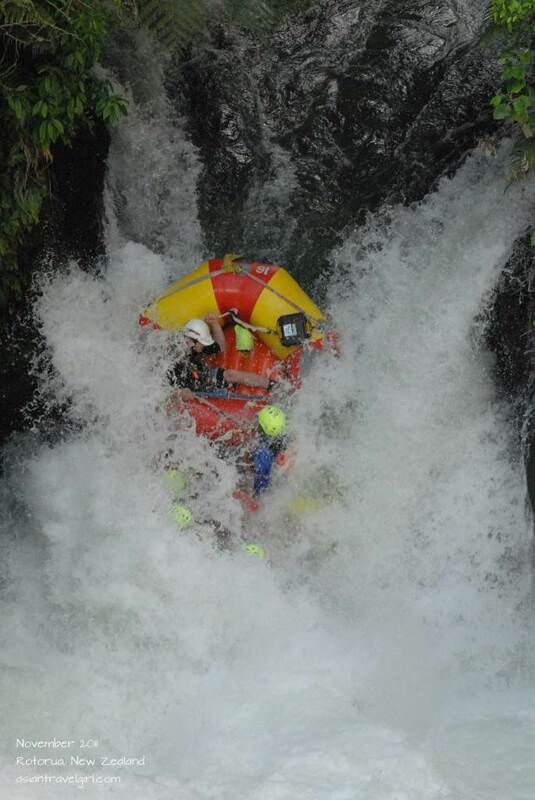 Life jackets, helmets, wetsuits…the usuals. Apparently in summer there is not need to wear anything to keep you warm, a set of swimsuit and life jacket is all you need. From memory I don’t think New Zealand summer has ever been that warm…Since this is an extreme sport, we are not allowed to use our own cameras. 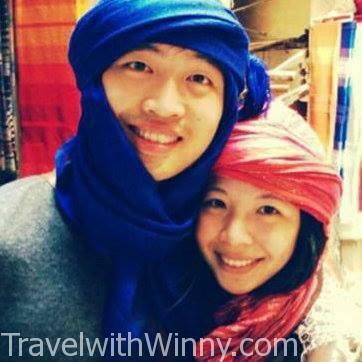 The photos they took for the past travellers online seems amazing though. From now on all the photos are done by professional photographer. 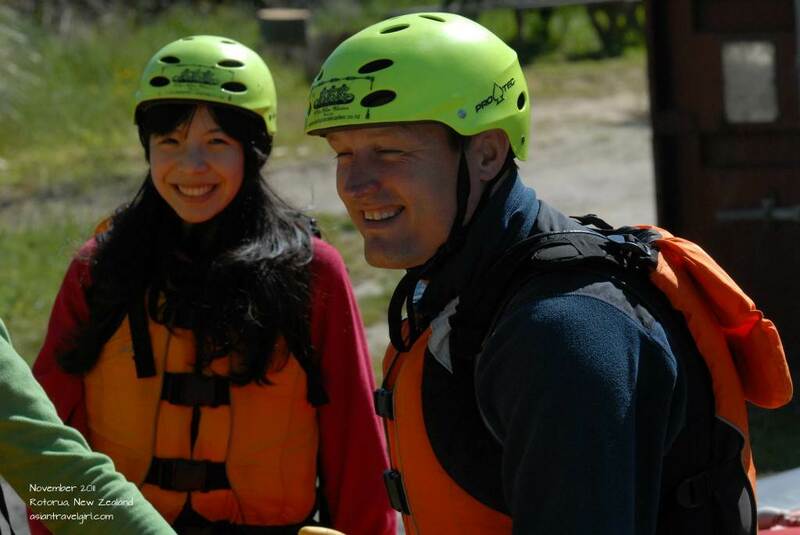 Before we proceed to the actual white water rafting, we first needed to understand all the safety procedures first. We did this by having a “fake” raft outside the barn and mimic the rowing motions on concrete. 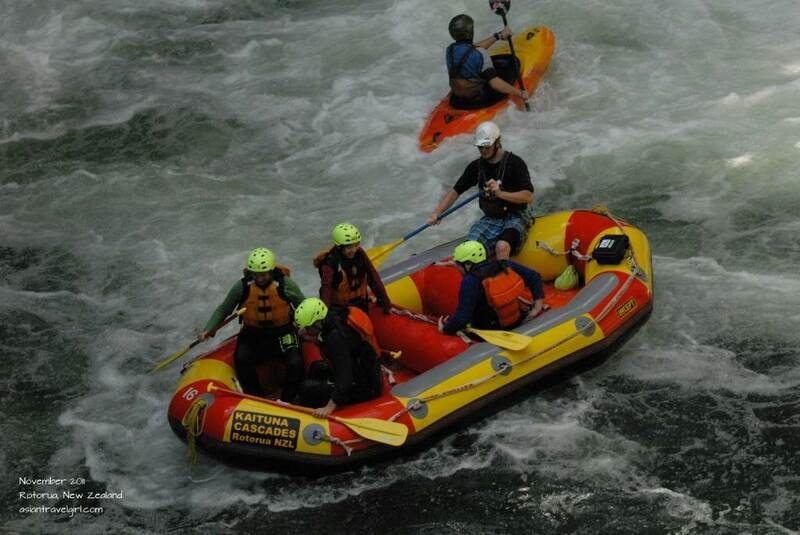 If we are about to capsize, just hold on tight to the raft. They are your biggest lifebuoy. 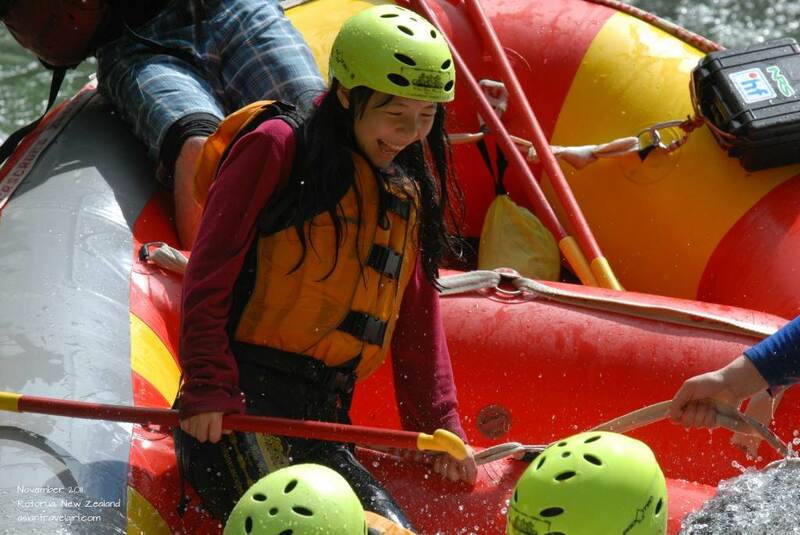 If you do fall out of the raft, they will only laugh at you and ask you to swim back, or they will use a paddle and drag you back. Generally it is pretty safe. Since it is early morning there were only 4 people in the group, which is good for me since I don’t want to be blocked in photos! Initially I thought the photographers are the ones in the small rafts next to us, but it turns out they were just there to ensure our safety. The actual photographer was actually in the forest above us, running and following our raft to take some action-packed photos. From here onwards will be picture story time. The first baby waterfall we encountered. 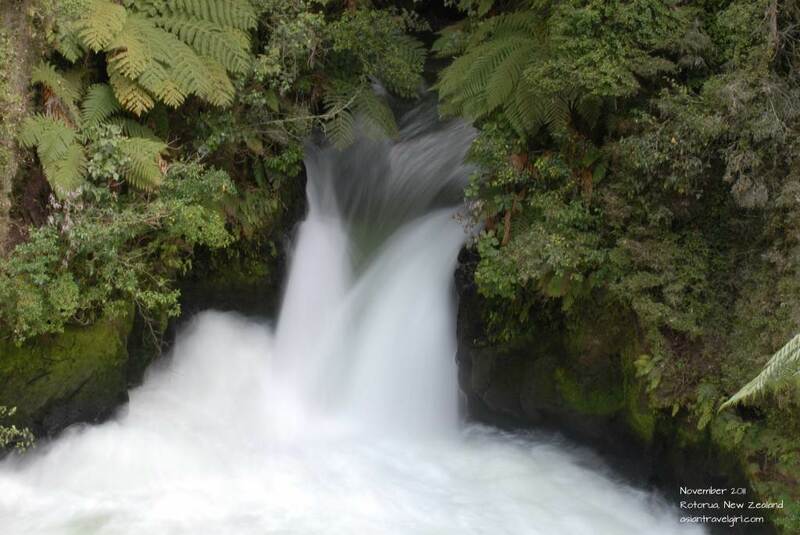 Apparently we will go pass 3 different waterfalls, each one will be bigger and bigger. I really didn’t have much arm strength for paddling. Kept hitting the girl in front of me. 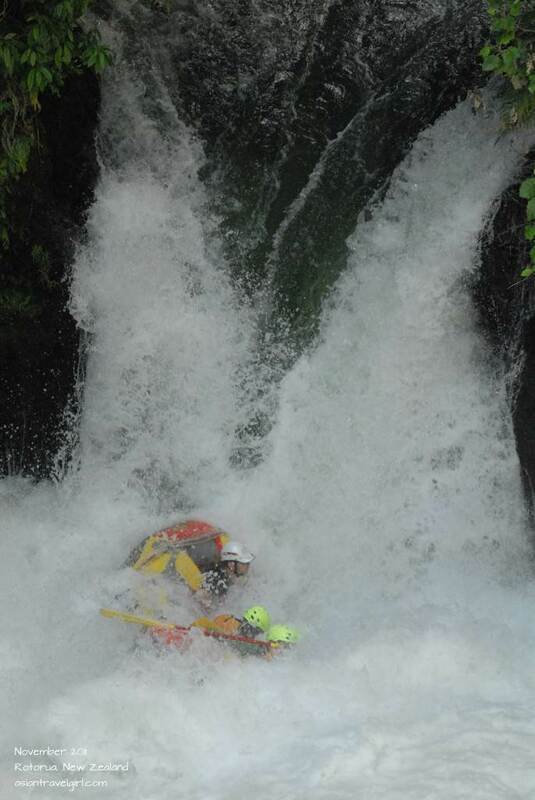 We are reaching our 7m waterfall, had to paddle extra hard to reach the top! Suddenly the guide yelled at us to position our body as low as possible! 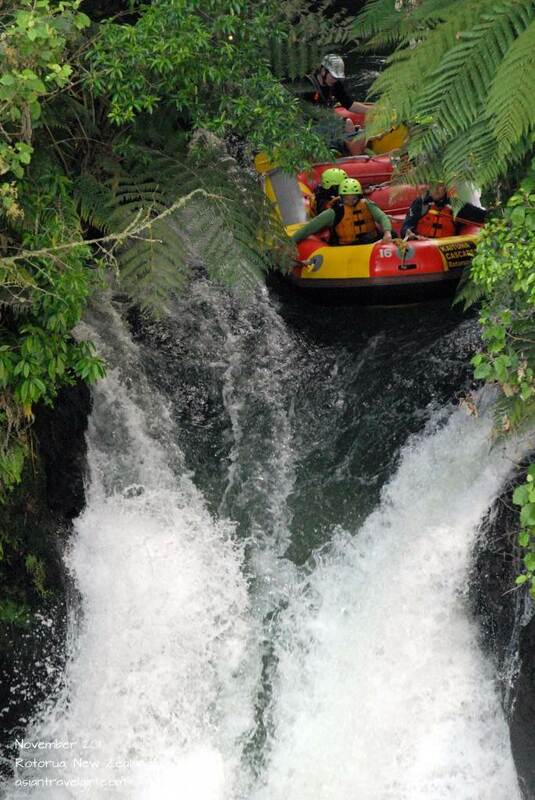 Hold onto the paddle tight, tuck our feet inside the raft and down we go! It happened way too fast, had no idea what happened! I only knew we didn’t capsize. 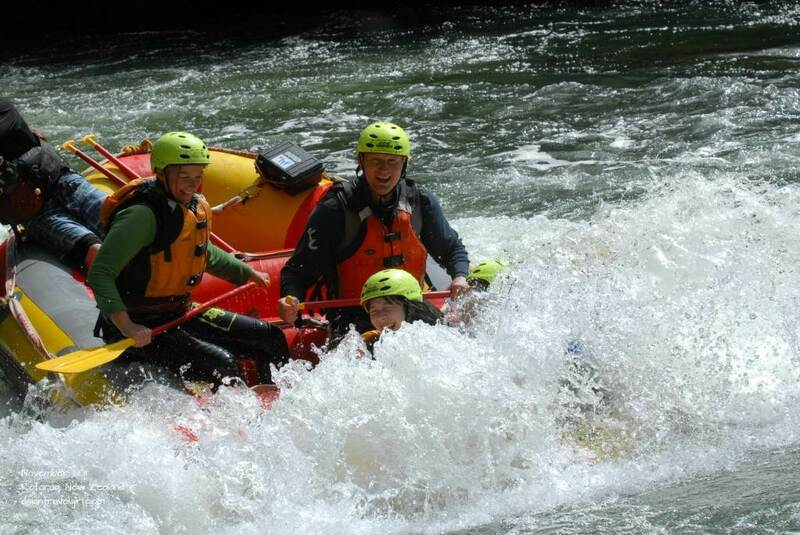 Afterwards we looked over the photos together and realized we did almost capsize. Even the photographer thought we won’t make it. 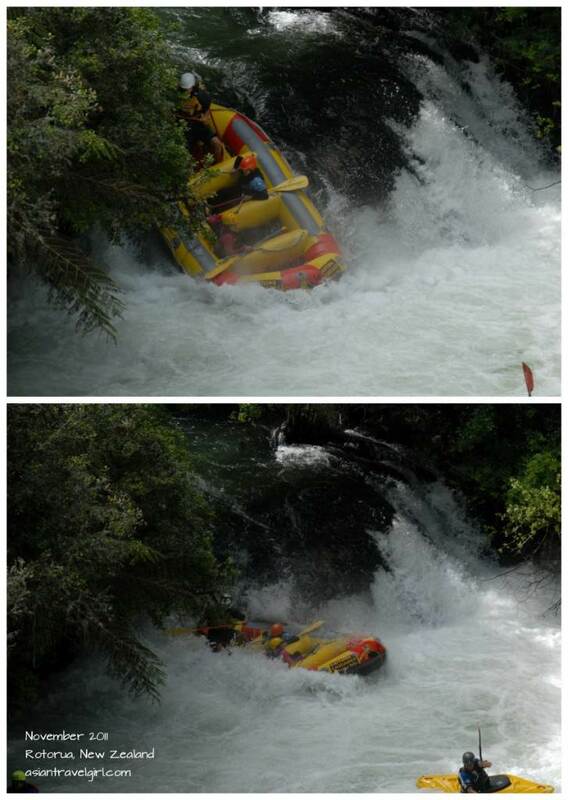 If we did capsize, we would need to swim upwards as quickly as possible or towards the bottom of the raft since it will create a small area of air space. Luckily none of this didn’t happen, or else I might freeze to death! Somehow we flipped back to normal! From the background, you can tell how big the waterfall is. 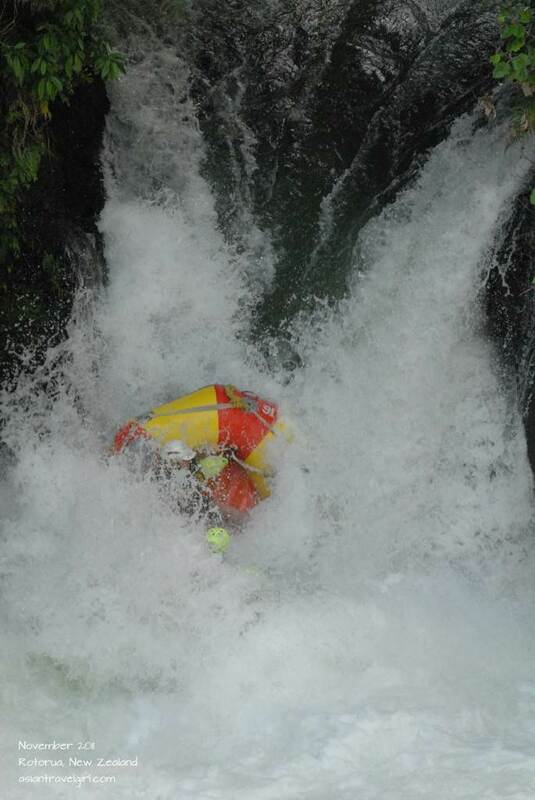 Hard to imagine we just fell down a 2 storey building height waterfall. Where was the photographer?! Couldn’t find him at all! Getting extra photo opportunities. I love it when they provide chances like this. Making every moment worth it! It was a pretty fun way of finishing our 50 minute trip by placing us at a place against the river current to get some epic facial shots of us getting splashed by icy cold water. Thanks god for the invention of thermal and swimsuits. Full on icy water hitting my face! 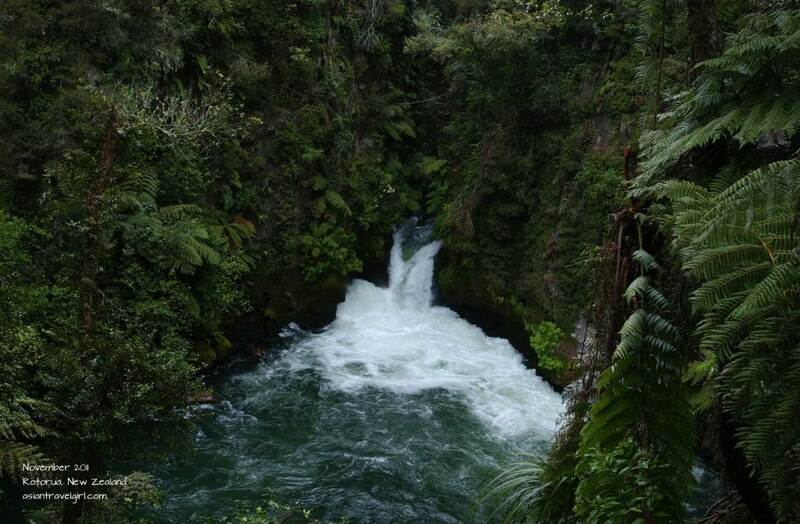 During the calmer period of the raft, I just want to sing “Just around the Riverbend” from Pocahontas in my head…Forgot to mentioned we did our trip through Kaituna Cascades (Raft & Kayak Expeditions), can go check out their site! Had so much fun on this day and the extra photos were so worth it!! Such great images!! Thank you so much! !